Location of Streamwood in Cook County, Illinois. Streamwood is a village in Cook County, Illinois, United States. The population was 39,858 at the 2010 census. 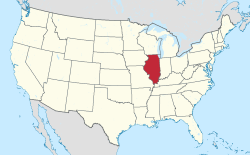 It is a northwest suburb of Chicago, and is a part of the Chicago metropolitan area. A major retail sector has developed in recent years at the intersection of Illinois Route 59 and Illinois Route 19 called Sutton Park. In addition to the Sutton Park Shopping Center, stores and businesses in the area include Super Target, Marshall's, Discovery Clothing, Famous Footwear, Yankee Candle, Wendy's, Chili's, Panera Bread, Chase Bank, America's Best, CVS Pharmacy, T Mobile, Bank of America, Steak 'n Shake, Pearle Vision, Starbucks Coffee, Hair Cuttery, UPS Store, Subway Sandwiches, GameStop, Jimmy John's, Taco Bell, Arby's, 5/3 Bank, and Great Clips. A red light camera was installed in June 2009 at Illinois Route 59 and Irving Park. Several signs have been posted warning drivers of its presence. Streamwood is located at 42°1′14″N 88°10′24″W﻿ / ﻿42.02056°N 88.17333°W﻿ / 42.02056; -88.17333 (42.020627, -88.173409). According to the 2010 census, Streamwood has a total area of 7.854 square miles (20.34 km2), of which 7.82 square miles (20.25 km2) (or 99.57%) is land and 0.034 square miles (0.09 km2) (or 0.43%) is water. As of the census of 2010, there were 39,858 people, 13,034 households, and 9,945 families residing in the village. The population density was 5,096.9 people per square mile (1,963.4/km²). There were 13,629 housing units, at an average density of 1,742.8 per square mile (671.4/km²). The racial makeup of the village was 66.0% White, 4.5% African American, 0.9% Native American, 15.0% Asian, 0.04% Pacific Islander, 10.6% some other race, and 3.0% from two or more races. Hispanic or Latino of any race were 28.2% of the population. There were 13,034 households, out of which 41.6% had children under the age of 18 living with them, 60.7% were headed by married couples living together, 10.6% had a female householder with no husband present, and 23.7% were non-families. 18.7% of all households were made up of individuals, and 4.6% were someone living alone who was 65 years of age or older. The average household size was 3.04 and the average family size was 3.49. In the village, the population was spread out with 26.3% under the age of 18, 8.0% from 18 to 24, 32.0% from 25 to 44, 25.6% from 45 to 64, and 8.0% who were 65 years of age or older. The median age was 35.4 years. For every 100 females, there were 98.3 males. For every 100 females age 18 and over, there were 95.9 males. From 2009-2011, the estimated median annual income for a household in the village was $71,300, and the median income for a family was $80,608. Male full-time workers had a median income of $46,338 versus $39,956 for females. The per capita income for the village was $27,788. About 2.0% of families and 3.9% of the population were below the poverty line, including 4.0% of those under age 18 and 13.3% of those age 65 or over. In 2011, 5,978 (15.0%) of Streamwood's residents were Asian, making it the Chicago suburb with the ninth highest percentage of Asians. From 2001 to 2011 the Asian population increased by 90%. A mosque opened in Streamwood in 2004. The village is primarily served by a unified school district, Elgin Area School District U46, the second largest school district in Illinois. U-46 provides educational services to nearly 40,000 students in area of approximately 90 square miles (230 km2) in Cook, DuPage and Kane Counties. A small subdivision east of Barrington Road is served by School District 54 (Kindergarten through Junior High) and Township District 211 (High school.) The village is also served by and falls entirely within the boundaries of the Elgin Community College District. The village is also one of the locations of Northwest Academy, a private therapeutic day school serving special education students from school districts within a 50-mile (80 km) radius. The village is primarily served by the Poplar Creek Library District and the Streamwood Park District. Residents east of Barrington Road are served by the Schaumburg Township District Library and the Schaumburg Park District. Residents who live west of Rt. 59 are served by the Gail Borden Public Library District in Elgin. The Streamwood Stride is an endurance race. It is held in Streamwood on the second weekend of June. The 2010 Streamwood Stride was its 12th race, and included the 5k run/walk, the 10k run, kiddie races of 50m and 100m, the double derby (which is Streamwood Stride teamed up with Bartlett Blossom Run), and the 1-mile (1.6 km) fun run. Streamwood Cricket Club is a cricket club with players mainly from Streamwood and Hanover Park. Streamwood Cricket Club was the 2009 champion of the American Cricket Conference. ^ a b c d "Profile of General Population and Housing Characteristics: 2010 Demographic Profile Data (DP-1): Streamwood village, Illinois". U.S. Census Bureau, American Factfinder. Retrieved March 20, 2013. ^ "Selected Economic Characteristics: 2009-2011 American Community Survey 3-Year Estimates (DP03): Streamwood village, Illinois". U.S. Census Bureau, American Factfinder. Retrieved March 20, 2013. ^ Selvam, Ashok. "Asian population booming in suburbs." Daily Herald (Arlington Heights, Illinois). March 6, 2011. Retrieved on June 19, 2013. "Streamwood: 15.0%" and "Streamwood also saw an increase in the number of Asian residents, up 90 percent to 5,978. Muslims began worshipping at a mosque there after workers finished construction in 2004." This page was last edited on 5 March 2019, at 16:44 (UTC).